I was the first member of OHCRA to arrive at the "Bill Moose Muzzle Loader Gun Club" in Darbyville, Ohio. I introduced myself to club member and caretaker Jim. Jim and I had a nice chat on this warm Friday afternoon. 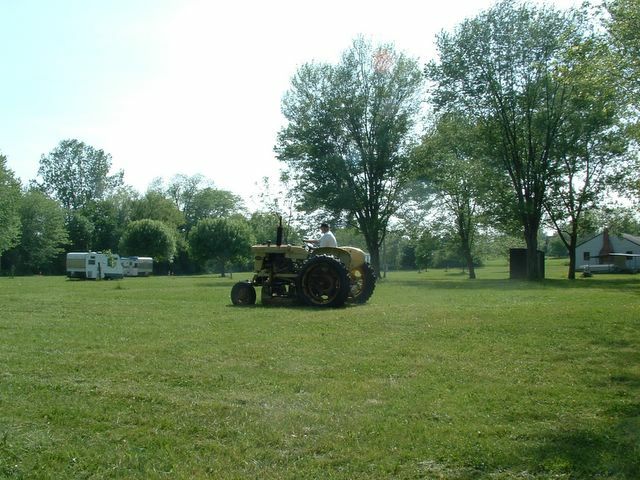 As Saturday is mowing day at the club, Jim decided to mow a spot for us to camp on so we wouldn't be in the way tomorrow. After all the hard work mowing, on the big yellow tractor, we just had to have a cold beverage. Bill Moose, who the club was named after, was the last Wyandot Indian in Ohio. I love those little tidbits of historical information. A couple hours later Ted showed up, followed by Jim and Jodie, Jock, Paul W. and John and Nancy. It was my first time meeting Jim, John and Nancy. Nice folks. John loves making wine and he's good at it. Tastes great, or less filling??? The weather turned cloudy in the evening and threatened rain but it held off, so we all sat around a campfire and chatted until bedtime. I received a new nylon tarp for Christmas, 10x12', and erected it over the tailgate of my pickup. I then added an 8x10' older tarp off to the side to create a nice covered area. Ted made fun of me, thought I was building a house. 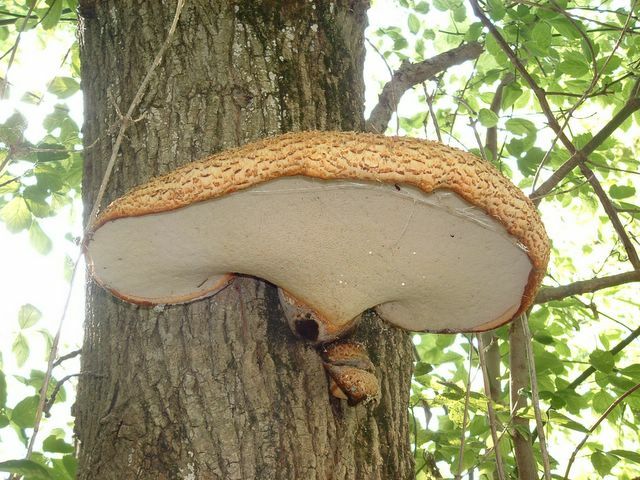 I found this huge fungi next to the river and just had to show off the pictures. Jim said something about being a fun guy!! I awoke Saturday at 6:12a.m. to rain, the slow steady kind. The "tarp house" came in very handy while heating water for tea and breakfast. The 8 of us discussed the canoeing opportunities and the rain situation. Is the rain going to stop? If so when? Ted, Jock and I wanted to canoe even in the rain. There wasn't any thunder or lightning so the 3 of us launched at 9:45a.m. All 3 of us brought solo canoes but Jock wanted to paddle Paul's tandem so I became a bowman. (It's easier to fish that way.) The other 5 "canoeists" stayed in the clubhouse playing euchre and napping. Jim, being the trip sponsor, planned a geocaching game. It was new to me, but all you need is a GPS. He hid 2 containers along the route with goodies inside. He gave us the coordinates and his GPS and we had to find them. Normally you take something out of the container and replace it with something you brought along with you for the next person to find. With only us 3 canoeing we pulled both containers. It differently sparked my interest in GPS receivers. I want one now. There is a giant website devoted to geocaching. Check out www.geocaching.com. 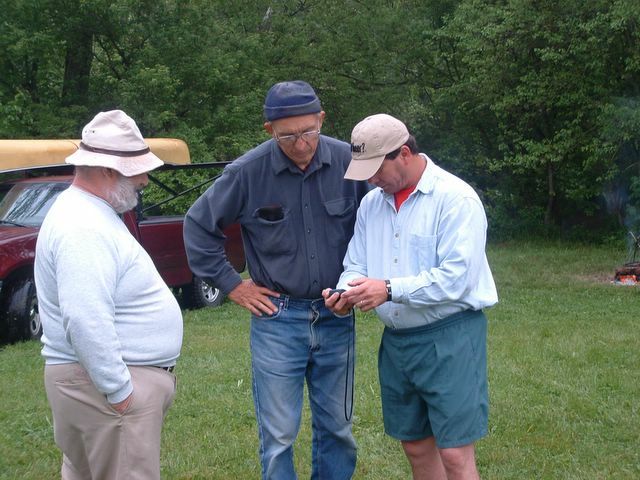 Here's Jim giving a GPS lesson to some old timers. From Darbyville to the merger with the Scioto River the Big Darby runs 12.5 mile. We also paddled 1.5 miles on the Scioto to the take out point where we arrived to at 2:40p.m. It finally did stop raining at 2:00. The Darby is nice on it's lower end. No portages at all, semi-clear water and enough twist and turns to keep things interesting. I caught 3 baby smallmouth while Jock caught their mother. A nice pounder. Paul and Jim met Jock and I for the shuttle back to camp while Ted headed for home. Jim supplied pork tenderloins cooked over the fire for supper. I had asparagus soup and Nancy grilled vegetables while Jodie I believe it was had rice. Paul finished us off with cherry pie. Sure beats dehydrated food!! After that gut filling meal we wondered back to another relaxing evening around the campfire. It threatened rain all evening but only an occasional droplet was felt. Woke Sunday morning to a very cloudy sky and patches of misty fog. 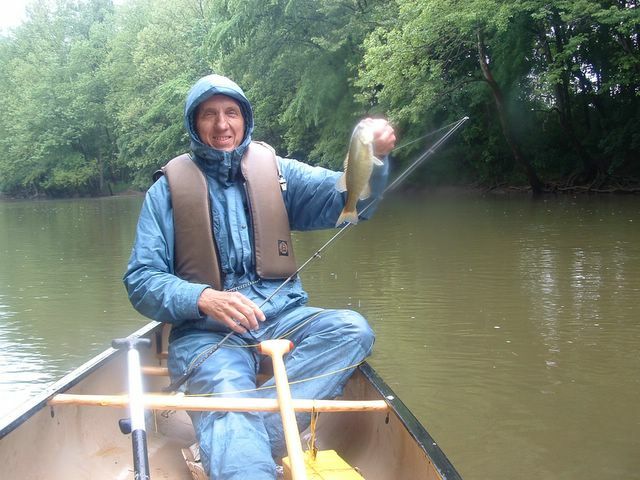 It wasn't raining so Paul shuttled Jock and I, 6 miles upstream and we floated and fished back to camp. Again I caught 3 baby fish. Rock bass. Jock caught another mother. Either walleye or saugeye. A nice 2 pounder or so. I couldn't get a picture fast enough but you can still see part of it. 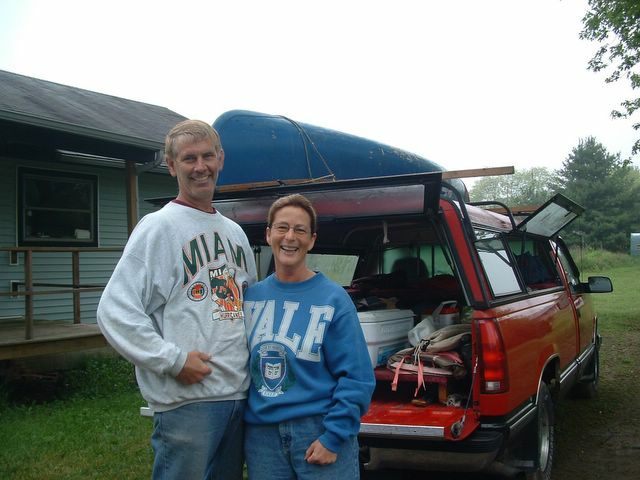 Jim, Jodie, John and Nancy canoed the 14 miles downstream that they hadn't canoed Saturday. Jock and I used Paul's canoe again Sunday and after we got back around 1:00 we loaded gear up and headed for home. My youngest daughter turned 14 and I had to get home and celebrate a birthday. Even with rain a canoe outing is a wonderful experience. Meeting good people, seeing Ohio's waterways and exercising the upper body. I can't wait for the June trip. 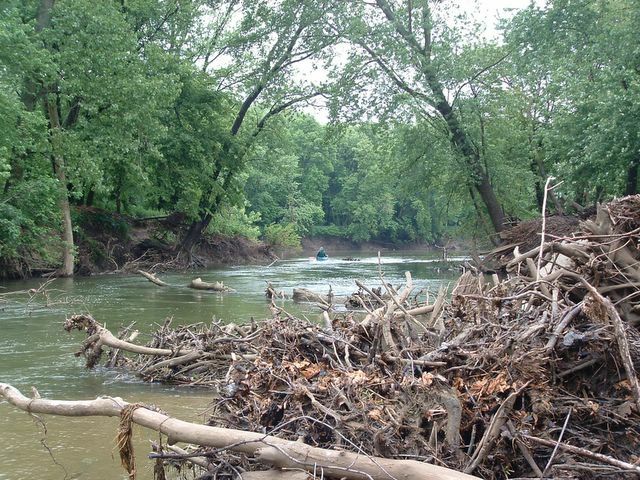 I'm sponsoring an upper Olentangy River trip June 4,5 and 6th. SEE YA on the Water! !